My home has a front porch, a roof deck, a bedroom balcony, a back porch, and a patio to decorate. That is a lot of outdoor seating to maintain, and unfortunately budget restrictions haven’t allowed me to utilize our outdoor space to its fullest. However, thanks to Pier 1 Imports, that is all about to change! Over the last five years, my back porch has just been an embarrassing storage area for junk. After 30 minutes of shopping at Pier 1, my back porch is now an adorable outdoor oasis! One of the things I love about Pier 1 is that you can make big changes with easy, affordable updates. I had the privilege of teaming up with Pier 1 to review their outdoor seasonal collections, and my biggest problem was choosing which products to review! Matt and I loved the outdoor sectional pictured below and thought it would work beautifully in our space. We talked to the store’s manager about our budget and furniture needs, and she was incredibly helpful in directing us to several options. 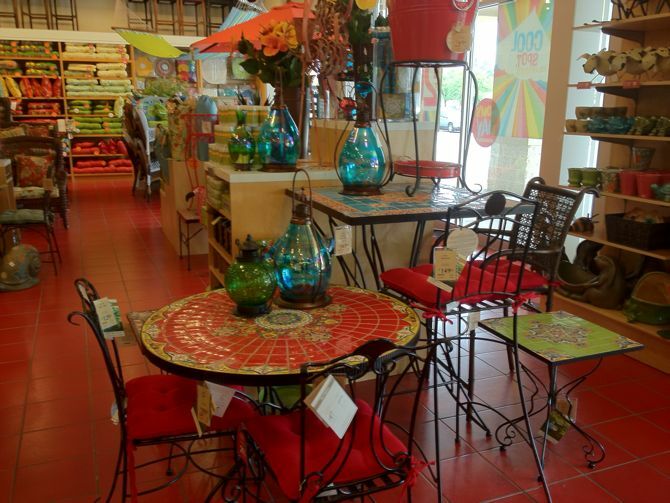 These fun and colorful bistro sets would easily spruce up a small space. 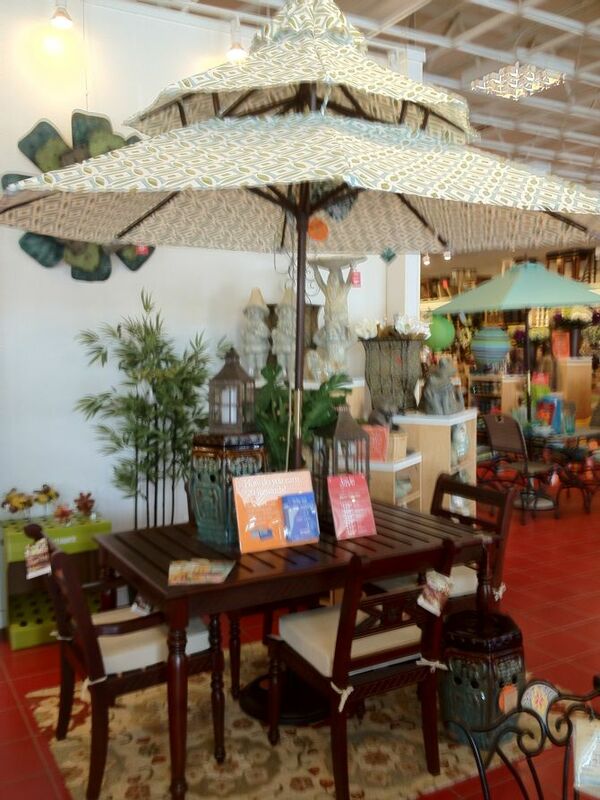 And these outdoor tables with beautiful pagoda and market umbrellas would be great additions to any deck or patio. Although this next photo isn’t of outdoor pillows, I know fellow toss-pillow addicts everywhere will appreciate the following eye candy! I secretly wish my bookshelves were transformed into Pier 1 pillow shelves. Wouldn’t that be dreamy? Okay, back to the task at hand: Let’s find some outdoor seating! I really liked the pattern and colors of the Angelique cushions, and I liked the sale price of the Casbah chairs. I decided to mix the two together to create this cute combination. The store manager suggested we try the embossed garden stool in the center, and I was sold! This subway art, called the Happy Panel, was too cute to pass up! Here is a close-up of my beautiful garden stool. This will look great in my living room during the winter. And here is the much-improved Pier 1 Imports after! I am officially ready for Memorial Day festivities now! But why should I have all the fun? 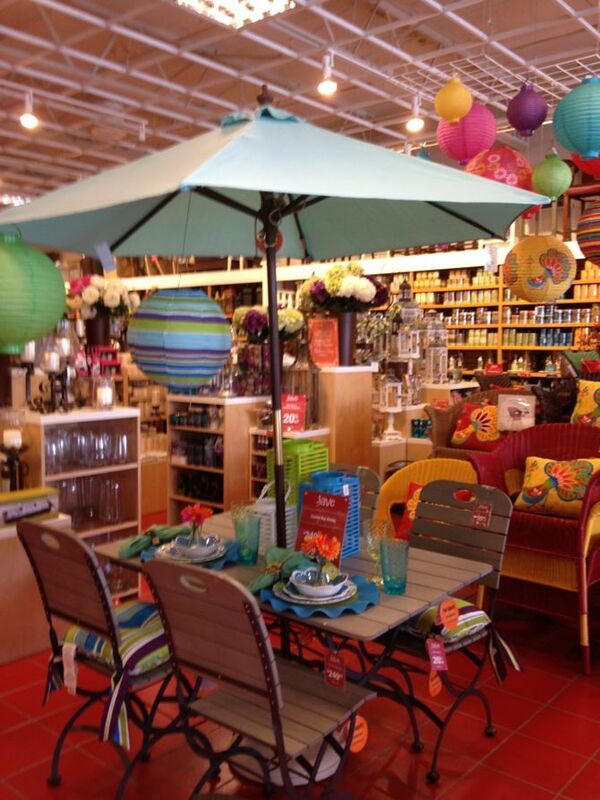 Pier 1 wants all Home Stories A to Z readers to achieve their backyard makeovers this summer. Follow this exclusive link to receive $10 off of your $50 purchase. Expiration is 6/30/12. In addition, one lucky reader will receive a $100 Pier 1 Imports gift card. To qualify, visit the Pier 1 Imports website, www.pier1.com, and select 3 outdoor products that are on your “must-have” list for this summer and then tell me in a comment why you made those selections. Be sure to visit Pier 1’s brand page on BlogHer.com, where you can read other bloggers’ reviews and find more chances to win! I love the Ciudad counterstools in Ocean– the height & pop of color are exactly what I need for my balcony! Also, the turquoise persian outdoor rug– what a great price! And I can’t wait ti hang the white cathedral lanterns– they’d add a touch of simple elegance, but the fact that they could house battery operated votives i can control by remote, make them even more amaxing!! I like these 3 items because they would fit on my back patio. great post! I love the chaise loune, white b glider and the catalina cove hammock.. these would really spruce up my boring backyard! I picked the Outdoor Citron Chair Cushion, Santa Barbara Glider Settee – White, and the Santa Barbara Rocker – White. I really like the glass lanterns, and I desperately need cushions for my not-so-comfy-wrought iron patio furniture, so I like the calliope cushions. And, just for fun, I like the rainbow lantern string lights. 1. Chili Pagoda Umbrella, I like the style and the color that will make everyone feel happy. 3. a pair of red Casbah chair to match the umbrella and table. i love the Outdoor Petal Pillow – Green,Outdoor Catalina Cove Hammock and the Peacock Pillow – Yellow. I would buy the chaise lounge and the pavillion pillow in yellow and the catalina striped pillow to spend as much time as possible reading outside in comfort! and the Tropical Bird yard decor! I love the Angelique cushions with the Carabelle side chair. The chairs would look great at the Jepara table for a nice dining on the deck. The patio set with an umbrella and new cushions of course! I love how your porch looks! So sweet and inviting without being over the top. Great job! We are moving and will have a blank back deck so fingers crossed. Thanks for the giveaway! The Catalina Cove Yoyo Braided Rug and the Outdoor Blue Garden Stool would be the final two pieces I would choose to complete my porch re-do. It’s been a long work in progress and I can finally see the finish line! The Fat Cat Stone would be an hilarious addition to the garden right off of my porch where my two fat cats love to lounge under the hostas on hot afternoons – a perfect tribute to my two “Buddha Bellies”!! I picked the summer wavy tray, Mexicali serving bowl, and Flores Platter because I like the bright colors and it would make a colorful outdoor party. I picked these because we have a small apartment patio that I like bright colors on! All 3 are cheery and compact. You’re patio looks great! That garden stool is really a beautiful color combo. For me, I love to entertain and make the most of my small space issues so I’m adding to my list a Ciudad Corner Chair, Ciudad Ottoman, and the Ocean Paper Lantern Set. I love the versatility of the Ciudad line and the paper lanterns will be the perfect pop of whimsy! Oh, I am in the middle of sprucing up my patio and these would add color!! Red metal beverage tub – love this! Would love to do some more sprucing up of my deck! I loved the garden table! I’d get the outdoor umbrella table, the citron pagoda umbrella and the green metal beverage tub, since our backyard could use a good pop of color for the summer! 🙂 Great giveaway! Outdoor daisy Bistro Table (to match the Daisy Swingasan chair I already have and love! ), 3 indoor/outdoor yellow pavillion chair cushions (to re-do the old rattan outdoor furniture we have which is surprisingly IN right now), and the Bee Birdhouse because how ADORABLE is that thing?! I like the Double Papasan Chair for comfort, Papasan Table Base for ease and the Fused Glass Butterfly Lantern to light the night. and the Twisted Optic Drinkware – because I love the colors! I love the subway art. I love the outdoor ciudad corner chair and ottoman on pier1’s site, they look like a comfy set to rest on while getting some sun on the porch, the metal beverage tub just looks cool and would come in handy for parties. Thanks for the review and giveaway. I love the blue and green stacking chairs for color and function, and the ciudad set and swingasan chair would add so much character to our porch! My patio is sorely in need of some new decorative pieces. I f I were to win, I would purchase the cat and bird planters (My daughter would love!! ), a couple of Cathedral Lanterns, and an outdoor Angelique Spice Pillow. Not on this post. Only two comments per person so leave your tweet in a new comment ;). Good luck girl! Kaeden Indoor/Outdoor rug, Owls doormat, and the peacock outdoor pillows…so cute! Three of my favorite outdoor products include the stacking armchair in green along with the pavillion pillow in yellow and the embossed garden stool, all in the an effort to add color to my patio. So many great things! My top three would be: White Casbah chair, calliope mum rug, and aqua market umbrella. Thanks for the giveaway. 1. The Sunset Pier Outdoor Settee. 2. The Sunset Pier Dining Chairs. 3. The Pavilion Cushions in Green. I would love some of the green stacking arm chairs, the scatter daisy pillows and the green Rania accent table! I have no idea where I would put them, but I would love to have them! love that garden stool as table. i so need to do that! What a fun giveaway! Pier 1 is awesome! There are so many things I want from Pier 1 but my 3 favorites are: the Boots planter, the Aqua Market umbrella, and the Ciudad Loveseat! So many choices! 3 must haves: Happy Panel, metal beverage tub, and some hanging lanterns. Thanks for the chance to win. 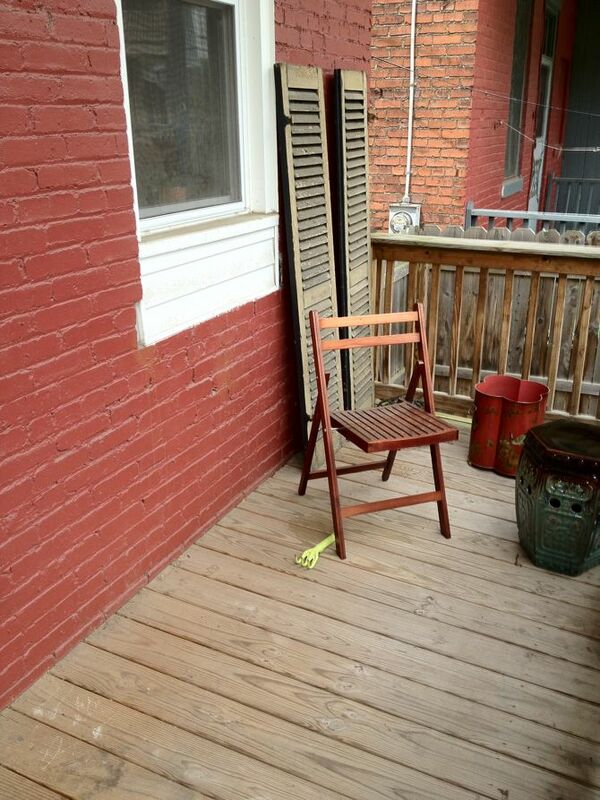 I would love to spruce up my back porch and get it ready for summer meals. I’d choose the multi coir rope doormat, red scatter cushions (ours are horrendous) and also choose the aqua umbrella (we’ve never had one for our table) I love the bright colors!!! 3) Love the Cathederal Lanterns – would look great on side tables near my new Stacking Chairs. Pier 1 stuff is so cute! I’d choose the wicker adjustable chaise lounge, papasan chair, and yellow peacock pillow as my favorites. I love the Santa Barbara bistro table (light brown), Indoor/Outdoor Calliope Latte Chair Cushion and the Santa Barbara Glider Settee – Light Brown. This would go great on our back patio porch. We really could use some new furniture. Marchella Counterstool , summer floral tumblers and the Flores Divided Server. They are all beautiful and I love the colors. I would definitely need them to complete my outdoor table! 1)Pagoda Umbrella—Need some shades and I love this color. It makes me happy just looking at it. 2) Daisy Swingasan™ Chair—I know my kids would love to sit in this chair. It’s totally gorgeous and cute. Hey, it matches my Pagoda Umbrella too! 3)Doves on Pedestal Birdbath–My little girl adores birds and I’m sure this bird bath would attract many birds to our outdoor area. I love it. I’d like one of the umbrellas, lemonade dispenser, and the wood rocker. They would make a perfect summer day on my deck. 2. Chili Market Umbrellas to keep cool under shade on sunny days. 3. Santa Barbara Rocker – Light Brown – to spend nice days outside and read. I would pick the red casbah chair, the peacock pillow, and the daisy paper lantern. I need a nice comfortable outdoor reading place and this would do it. I have an empty patio!! So, I would love the Angelique umbrella, the polystone umbrella base, and the Adjustable Chaise Lounge! Would love the opportunity to spruce up my patio with pier 1 ! the Outdoor Catalina Cove Bistro Cushions, the Red Metal Beverage Tub, and Striped Doormat. Sorry about the links, my bad. Just disregard the links and leave the item names please. I also forgot to add that I love your choices; very pretty, warm, and welcoming. Good job! The Love Birds Doormat; Outdoor Terracotta Petal Pillow and the Coco Cove Outdoor Wicker Settee are on my “must-have” list for this summer! Awesome! I’m loving the paper lanterns and outdoor rugs! I love Pier 1! Great giveaway! I would buy the green pavillion pillow, green metal beverage tub and the embossed garden stool. Would love to win and so need new chairs for our back deck! What a great giveaway! Ohhhh where to start? I’d love these: the metal beverage tub would be perfect for poolside!, the round bistro cushion in Calliope Maui will go great with the orange and blue them I’m trying, and I must copy you with that fantastic garden stool! citron umbrella, casbah chairs, and santa barbara bistro table– because I’d love to sit on the deck and enjoy a mojito every now and again. I don’t have any outdoor furniture or decorations yet. First, I want Daisy Swingason Chair. I also love the Outdoor Rania Mosaic table. I love those Casbah chairs! The red one is next on my list. The Catalina Cove flower rug because it would brighten up our drab concrete patio. The aqua umbrella to provide much needed afternoon shade. The Santa Barbara glider settee to provide much needed cushy seating(all we have now is hard metal folding chairs)and so I can cuddle up and glide with my little guy. Your porch looks great !! Love the chairs!!! I have small porch too, and it def needs a pier one face lift! 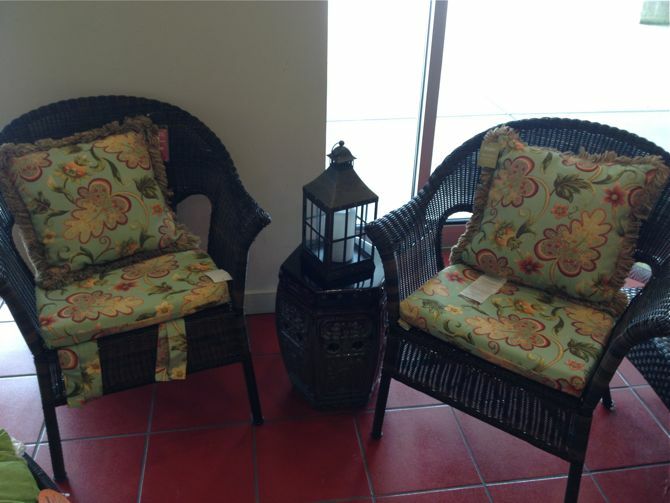 what i’d really like is two wicker lawn chairs, some new pillows to brighten things up, and a lantern for our patio. I’d get some lanterns, cushions and a tray to soak up the sun during meals. And the Yellow pavillion pillow I want for my couch! I would pick up the adjustable chaise lounge, the ciudad counter table and the mocha counters tool to go with! I’m moving to a new apartment and these would be perfect for relaxing on the porch! Hi Beth! I LOVE your blog! I’ve been following you for over a year now and you’ve inspired many projects in my home (I totally stole your floating shelve idea in my powder room– I wish I felt a little bad about it, but it completes the space so well, I don’t, haha). 3. Santa Barbara glider settee- light brown: with some beautiful throw pillows, this would bring some company and more seating to the lone, square, 4 person table that’s all alone, haha. I love pier 1! it was so hard to chose just 3! I would get the yellow umbrella. So pretty…LOVE Pier 1! We have a fabulous wrap around covered porch that only has two rockers and an area rug right now and I am dying to add color. 1. Hot Floral Art~to go above our new porch swing that I just decided I HAVE to have when I saw the picture!! I’m not actually trying to enter the contest but just had to say your porch looks totally charming. I love the garden stool! And some new cushions would spruce up my patio. I would LOVE the butterfly outdoor lights, hanging lanterns & candles. As I’m sure you guessed, I need more lighting outside! Great giveaway! I’d choose some new outdoor pillows, beautiful lantern and the cobalt rim glassware for my margaritas! My first choice is the daisy swingasan chair. Why? It is fun, it is bright and it swings!! Second are the ocean blue and fiesta paper lanterns. Why? Cause my blessing would like them. Third would be the citronella filled candle set. Why? The bugs like me but I don’t like them and it comes with its own storage container. Beautiful! 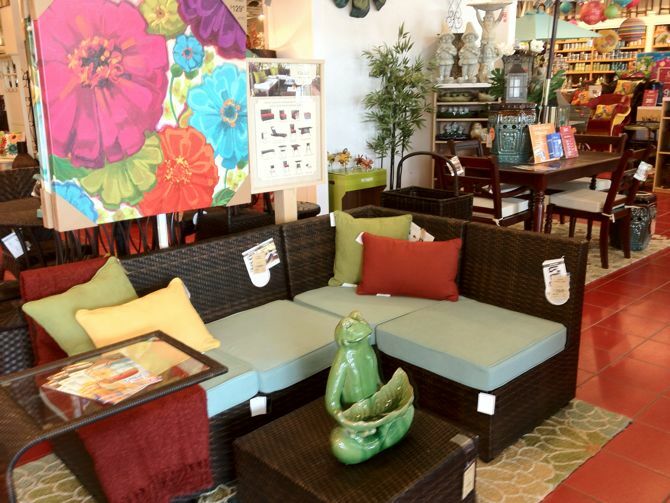 I was just looking at Pier One’s outdoor furniture today and saw so many things I need! I could really use two of the chairs just like the ones you got, Beth. And of course, some cushions to go with the chairs. Many thanks for the chance to win!! not sure why my first post didn’t show up! Your porch looks more inviting with those chairs. So what would I like at Pier1? Everything but since I have to pick 3, here there are. 1. Beverage tub on a stand. 3. An outdoor rug. Really need one of those! Catalina Cove outdoor dinnerware – – cuz it’s SO cute! Umbrella Tealight Centerpice – – to but around my umbrella stand! Citronella filled green candle – – cuz it matches the catalina cove dinnerware & I LOVE green! What an awesome giveaway! I would love to find a new rug for my house. I would love lanterns to hang from my trees in the yard, a new market umbrella with a fun print and new cushions for my handmade wooden double glider. Your porch looks great, have you considered an outdoor carpet? They really pull a room together! I love mine! I am looking for pillows and didn’t know where to start. Hello! This blog post was perfect timing. I need a lumbar one, green garden pillow and the beaded bird. Now to get a rug to match!! Thanks for the give-away! Renea. 3) Summer Wavy tray to bring ice tea and lemonade!! Ohhh would love a $100 gift card at Pier One! I was just in there looking at all their pretty outdoor things last weekend! Absolutely love the “Happy Panel”! My husband thinks he can make one, but I can still def use some credit for other things at one of my favorite stores! I hit enter too quick! I like their floor screens, the trunks and I’ve always liked their candles. Catalina Cove Outdoor Dinnerware for some fun outdoor eating. Outdoor Jepara Dining Table because it is so cool for outdoor dining! Stacking Armchair – Green also cool for outdoor dining! My must have is the Santa Barbara glider White Settee, the Green pavilion settee cushion, and the Catalina cove flower rug! I really want EVERYTHING! Pier 1 is one of my most favorite home stores! I love the peacock pillows! The outdoor garden stools are great too. I’m a sucker for those dragonfly string lights. Wow, this looks great! I love Pier 1 Imports! …and a tall glass of ice cold sweet tea! 1. 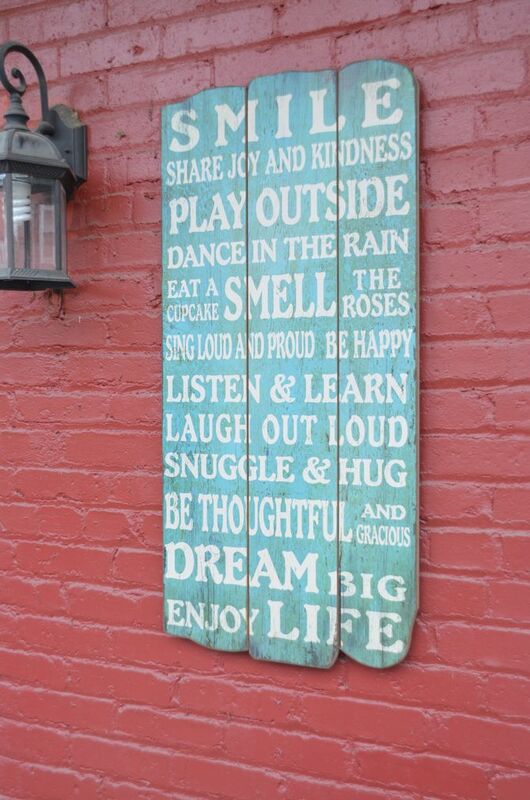 The Happy Decor sign you have – LOVE IT! 2. Scroll umbrella center piece – I’ve been wanting one of these, may use my coupon! 3. The Outdoor Daisy Table – so cute!! I love the way you added color with the cushions and pillows. I need the happy panel. The garden stool would look great on my patio! I have read the rules and I would soooo love to win this! We have a 100 yr old home with a lovely enclosed porch that we are renovating. It would be perfect. We have similar taste! I also love the garden stool and happy panel! I am also always drawn to lanterns, such a fun accessory. Pier one is a great place to find wonderful things. I have been coveting all their tasting sets. Would be fun to have for parties. Your patio looks like a happy place to be! I love the Casbah(sp) chairs what beautiful colors! 1. The Swingasan chair – my girls and I would fight over who gets spend reading time in this chair! 2. I’d love to have some cute summer dishes! I especially love those confetti glasses. I love the sectional you pictured. We really need some stack-able chairs too, ours gave out this year, a market umbrella would be great also. I need pillows and more pillows. I also like the hanging lanterns. Thanks. I love the Santa Barbara furniture, the Cataline Cove pillows and the metal drink tub stands. I would love some pieces from the Santa Barbara collection – a chair, settee and small table. Out patio is barren so I definitely need some help in order to spruce it up and make it a fun space. okay, I LOVE the little turquoise rabbits, they are a fun punchy color and would look so cute in my flower beds. Also, rugs…I like all of the rugs, but the Angelique rug stands out to me. AND last, I love the limey green garden stool. This looks great! I have actually been meaning to update my back patio for a couple months now so this is coming at a perfect time! Great upgrade!! I love the Calliope Mum Rug, Outdoor Ciudad Armless Chair (the whole set, actually), and Blue Jeweled Mini Lantern. Thanks! I love the Calliope Mum Rug, the Santa Barbara Rocker, and Calliope pillow. These would make a great retreat on my back porch to read. I love their little blue jewel mini lantern and the pavillion pillows in green. thinking of getting the stripe market umbrella! Love the update on your back porch! The entire CuiDad collection. I need some back patio furniture! Great porch sprucing-up! I need (!!!!) some of those Casbah chairs and the wicker side table to complete a seating area on my wraparound front porch. We moved to this house one year ago, and devoted all our initial energies and budget to “feathering” the inside of our new-to-us nest. This spring we poured heart and soul into creating landscaping from scratch. 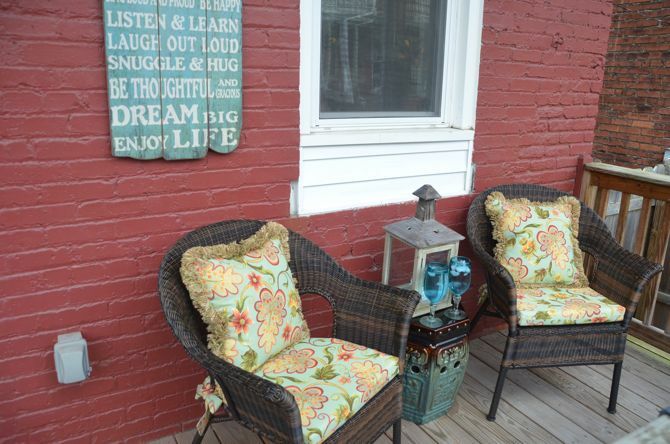 Now it’s time to create the spot on the porch that drew us to this house to begin with! Fingers and toes crossed. Have I said how much I ADORE Pier 1? Because I truly do. Our very first furniture purchase as newlyweds almost 30 years ago was a papasan chair from Pier 1. They’ve had me like putty in their hands ever since. The wicker chairs and cushions you chose are beautiful! I LOVE the hanging lanterns, the colored stools, and new wine glasses would be great! By the way I may need to own the porch sectional too!! Have you seen the Swingasan Chair? I would love to see that live in our backyard under the big gingko trees! Throw in a Cataline Cove Yo Yo Rug and maybe a Geometric Pagoda Umbrella and I would be just be set! Your deck looks awesome, and I especially love your garden stool! There are so many things that I like at Pier One, but I would love their red metal beverage tub, some red and orange stripe glassware, and the drink dispenser on a stand. I would like all of these things because we have big, family gatherings and the beverage tub and dispenser would be so convenient to everyone! Totally obsessed with outdoor decor right now, as we close in two weeks on a house that has both a screened-in porch AND a lovely patio! 1) The ciudad sectional just screams sophistication! It reminds me of the gorgeous decks overlooking the ocean at the W Hotel in Fort Lauderdale. 2) The white lantern string lights hung above our patio would provide just enough illumination for those warm summer nights. 3) The green metal beverage tub – filled with beer, of course — would be too cute on either the screened-in porch or patio when we have our housewarming party. Totally love the geometric pagoda umbrella, the outdoor swingasan chair, and the peacock throw pillow. They ALL make me happy and would be perfect for our new home! Gimme a couple of those Santa Barbara chairs in light brown with the yellow pavilion indoor/outdoor cushions and a yellow umbrella. i would be in patio heaven! thanks for the chance to win, love it. he santa barbara end table and the umbrella and the hanging swing are just about right for this summer! thanks for the pier 1 entry! I love your new updates! My picks from pier one would be the Jepara Dining Set and Red Umbrella! I am starting to add red and teal accents around my grey house. I am loving my additions but due to a large patio I need more outdoor seating and a place to eat! Thanks for your ideas! LOVE Pier 1! I’d love to have the Catalina Cove umbrella for the upper deck; the hammered blue drinkware, and the red metal drink tub. I re-tweeted: https://twitter.com/#!/FluteMommy Thanks again!!!! 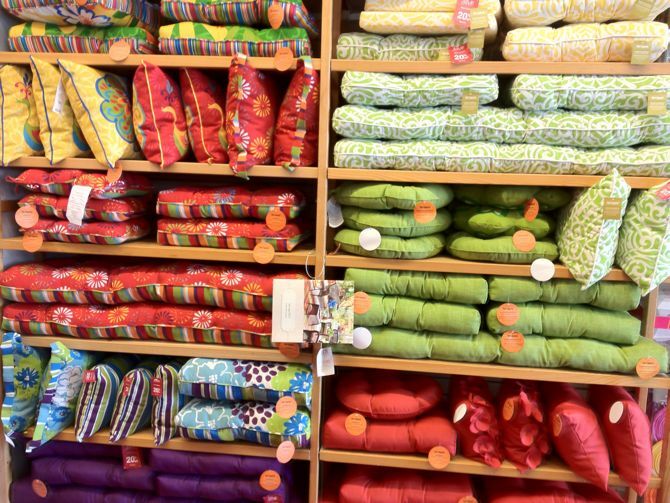 Pier 1 has the greatest stuff, I have always loved all of the colors in their textiles. Right now, we have a back patio that has a grill and a sandbox. I love the idea of putting up some subway art (yours was way cute and I’m inspired). I also love their casbah chairs in red (I’m thinking red against the green in my gardens) and the outdoor Angelique Rug – Spice colors or the Calliope Mum Rug. My hubbby has also been wanting a hammock too. Thanks for the giveaway! I love the subway art. You have created a truly beautiful porch area. I woudl love the Coco Cove settee and two chairs! They are the perfect size for our patio. I was choose the Aqua Deluxe Angelique cushions…the settee one for my porch swing and two of the seat ones for my white wicker. I love the fabric on them. I love the podasan swing! 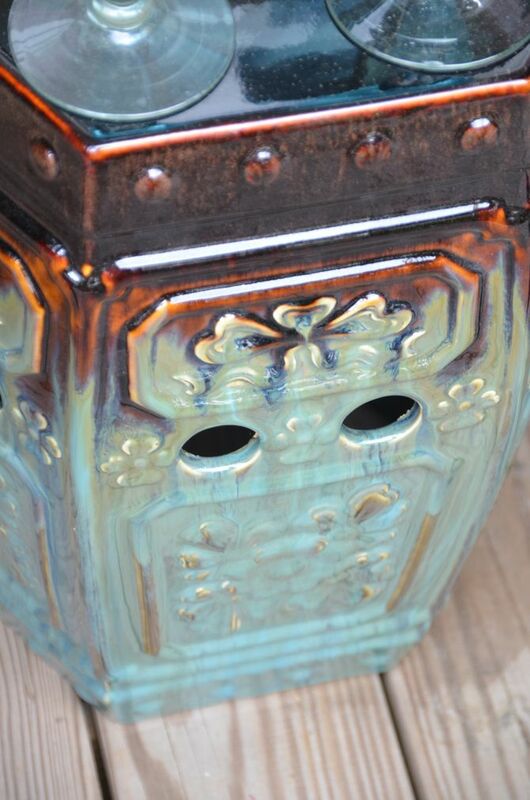 We need outdoor lanterns and their were so many I loved to choose from. I also love wind chimes. I liked the beads and bells wind chime. Thanks for the giveaway! 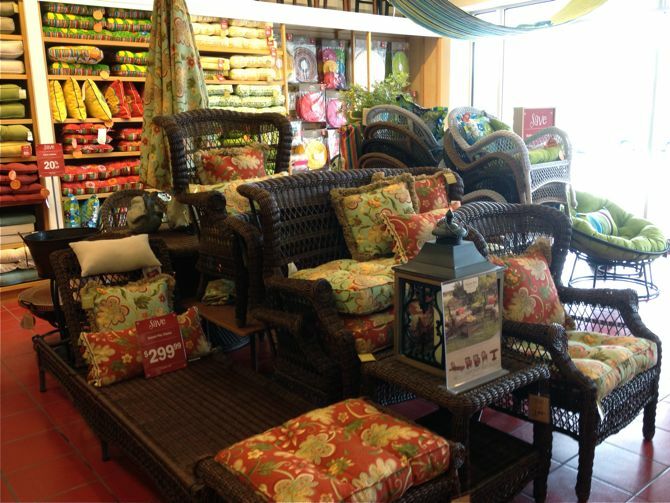 I was just at Pier One the other day, drooling over all their summer stuff! What a great contest to have!! No matter who wins, they will love shopping there with their gift card!!! Our new deck needs some finishing touches, so I would love to achieve that with lots of paper lanterns (loving the peacock paper lantern! ), the hand painted blue/green garden stool and the gorgeous Calliope Mum rug! Your new seating area is fab! & THE “Peacock Pillar” CANDLE TO LIGHT UP A LATE NIGHT! I would like the White Outdoor Wicker Settee, White Outdoor Wicker End Table and Citron Outdoor Accent Pillows because I need a new comfortable place to seat guests, plus they could set drinks on the end table, and this would look so pretty on my deck. I would love some new cushion, pillows, a patio umbrella, and a garden stool! Love me some Pier 1! I would love the sectional also!! Super cute, thanks for the chance! I would love some lanterns for some comfortable lighting for our summer parties! I would add in a few of their wicker rocking chairs with several cheering throw pillows and cushions for the perfect Texas summer party. I would like to add a Pagoda umbrella, outdoor rug and a ceramic garden stool to complete my outdoor room! 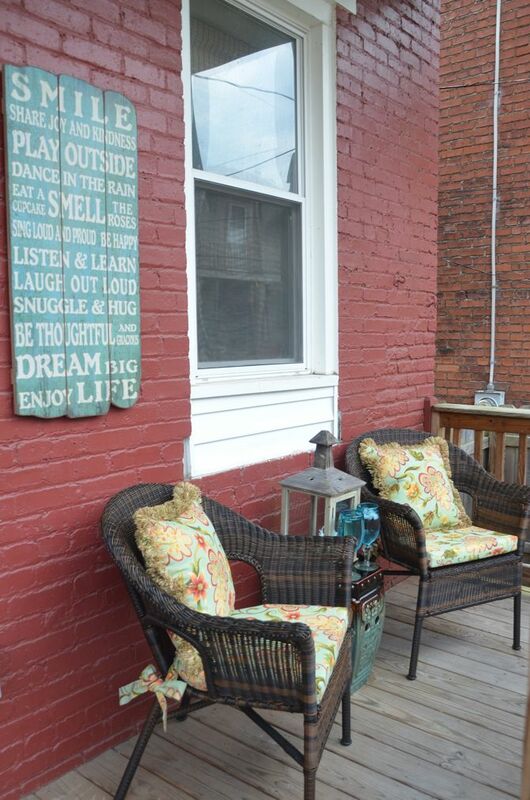 Love your porch – small changes make such a big statement. Pier 1 Imports is one of my favorite stores. Your patio turned out cozy and inviting, it looks great. My 3 must haves are 1.) New patio furniture that won’t be destroyed by the elements. 2.) Solar Lawn lights so we can add to the overall ambiance. 3.) A cute bird feeder that comes with its own stand. I tweeted the giveaway (it was my first tweet too). I would get two pavilion pillows, two pillows in maui, and a red metal beverage tub. Oh there are so many things I love. Your porch looks so pretty. I love Pier One and I would love the green metal beverage tub, the green pavilion pillows and the hammered drinkware. They would add some cheerful color to my deck (that is in desperate need of a re-staining!) Thanks for the awesome giveaway! I love the same chairs you picked. 1)Outdoor Swingasan Chair – My husband and I absolutely fell in love with them on our last visit and we have just the right tree for it. 2) Yellow Umbrella – We don’t have a roof over our patio so it can get quite hot. 3) Yellow Outdoor Stacking Armchair – These would contrast nicely with our black/bronze outdoor table. 1) Pillows- i need seat cushions for my new rattan chairs! 3) Planters- i love flowers so the more pots with flowers i can add the better! i’ve always wondered where to get one of those garden stools. i have been dreaming of them day and night. I love pier 1! We have one 5 minutes from our house and it’s a dangerous place! With out a doubt, I would choose the coco cove settee, side table and matching bench to go with the chairs we bought last year from pier 1. PS. Your back porch looks awesome and I love the cushions you got, I have the same ones 🙂 Thanks for the giveaway! I would love to have a set of stacking chairs, hanging lanterns and outdoor cushions. I dont have anything for my patio! I’d have to start with a basic coco cove wicker settee and then two chairs to match. But then I’d need cushions and an umbrella! Choices choices! Need so many things for our patio it is bare… would love porch lantern nights and some fun pillows… Pier 1 has the best stuff! Also love their tableware for outdoors. Thank you! 2. Indoor/Outdoor flat weave rug; Neutral color to go out on the deck. 3. 2 Ciuduad Corner chairs, one loveseat and 2 armless chairs plus cushions; It would make the perfect arrangement for the space on our deck. They look so updated as well. Pagoda Umbrella would add instant pizzazz! LOVE the Outddoor Swingasan Chair, the Catalina Cove Hammock, and the assorted Hanging Glass Lanterns! 2x outdoor ciudad chairs, outdoor ciudad ottoman and red outdoor garden stool. I could think of a million ways to arrange those items on my back patio. The catalina dish ware, the white casbah chair & the pavillion pillows in multiple colors are my top picks. I picked these because I like the bright colors against a neutral background and think it would work well on our deck. Thanks for the giveaway. Love that sign! I desperately need outdoor furniture… but still haven’t bought anything yet. I love the Ciudad Outdoor collection. And that embossed garden stool is amazing. I’d also get a few lanterns to light up the space. I love your porch! Our patios have been seriously neglected..Pier 1 has so many cute things that could really make it feel welcoming! Thanks for the chance! And my back patio needs some major loving. Currently it’s a stained messy slab of concrete and an old patio table with messy stains everywhere. I’d get 2 of the White Outdoor Wicker Stacking Armchairs and the Taza Round Outdoor Table for a bit of color on my porch! I have been looking every where for a nice outdoor set! 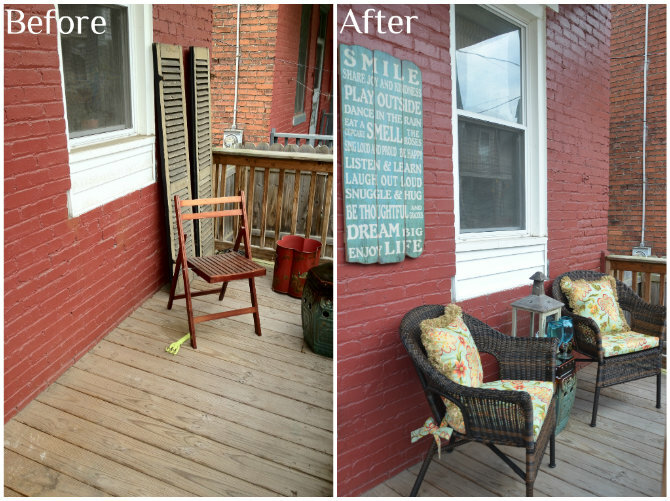 Your porch makeover is fantastic! We added on to our deck last year so now it is time to decorate. I would pick the peacock pillow in yellow, red and black damask doormat and the blue jeweled mini lantern….I hope I win!! I love your porch, it’s lovely and the colors are awesome. I love Pier One. My fav store. My porch needs an update too (it’s empty!). Love the blue stacking chairs and the taza round outdoor table. Amazing how relaxing your porch looks now, thank you for the give away. I would use those blue glasses to sip some white wine! I just love the things you chose for your outdoor area. That sign just adds so much with the beautiful color. Thanks for sharing your visit and ideas. I can’t wait to go and see what I might be able to find to use on my front porch. Thank you for this offer. I love what you chose! I liked the large lanterns, Santa Barbara end table, and Sunset Pier Outdoor Deluxe Chair and Settee. I would even use that chair inside – it’s so pretty. I would love this and get a cute garden stool for our patio! And outdoor dinnerware and new cushions. I’ve wanted a garden stool forever and you can bring it indoors for use in winter. Outdoor dinnerware because it’s not going to break if you drop it and new cushions because they are so darn pretty! This is great timing! We are just talking to contractors about getting quotes for a new deck and patio in our backyard. We hope to be able to enjoy it this summer! I would love the Outdoor Garden Stools in green, Casbah Chair, and Crochet & Crewel Floral Pillow! Here a few thing I need for my backyard and plan on purchasing this summer. 1. A patio umbrella, I just love the Citron Pagoda Umbrella. 2. An umbrella base, I like the Poly Stone Umbrella Base. 3. An outdoor rug, I like the Ocean Wave Vinyl Outdoor Rug. 2. The Outlook Ciudad corner chair – it looks sheek and comfy. 3. And to match that I’d need the ottoman so I could relax while the kids are running all over the backyard. You proch looks awesome thanks for the giveaway. Love it… You made some good choices for such a small space. I could relax with some sweet iced tea in one of your chairs… I really love the subway art too…I love the colorful wicker chairs at Pier 1.. Not sure if it is the chair itself I am in love with or the colors…. I’d love the fat cat stone because i think it’s hilarious and would be a conversation starter piece while in the backyard. The Sandshell umbrella seeing as our current one is all dingy and needs to be replaced. And, lastly, the sunset pier round table cause it’s just gorgeous. 2. Ciudad Corner Chair- This reminds me of the furniture at a resort in Aruba! 3. Ciudad Side Table- to go with my chair! I need additional accent tables in my sunroom, so I would choose the Rania accent table. The green metal beverage tub would be great to allow guests to serve themselves, and outdoor lanterns would create the perfect ambiance. I re-tweeted the giveaway – thanks! Your porch looks great! 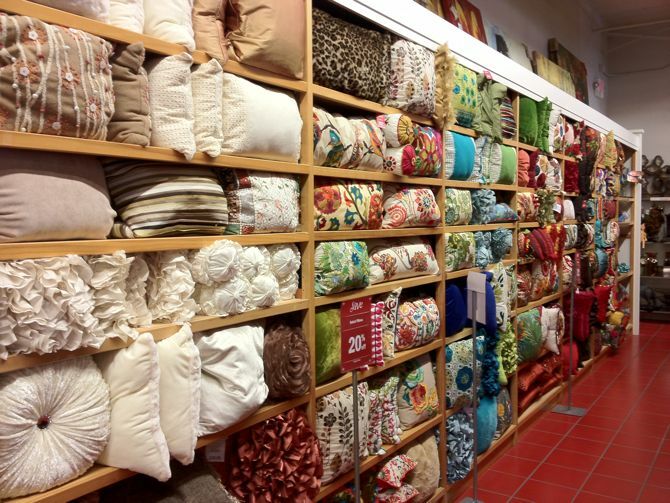 The wall of pillows at Pier 1 makes me drool! Thanks for the giveaway!